Non Golfers: late morning transfer to the town of Stresa and take the cable car to Mottarone mountain from where you willl enjoy a wonderful view of the lake below. 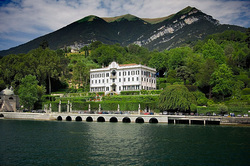 Transfer to Stresa and take a boat to the Borromees Islands. 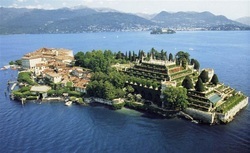 Isola Bella showcases a Baroque Palace with artistic themed rooms and terraced majestic gardens. These 17th Century "Italian" gardens contain rare exotic plants, pairs of strolling peacocks, an open theater, and statues. After breakfast the golfers will join their driver for a short trip to Golf Club Castel Conturbia. Dating back to 1898, the current layout, one of Robert Trent Jones, Sr.'s best designs, winds through trees, over streams, around ponds and has been the venue for the Italian Open. After this brief stop you will depart to village of Angera and see the castle recently selected as one of Italy's most beautiful. The castle sits high on a cliff with an imposing view of the lake below and is approached through a forest of lovely chestnut trees. After breakfast everyone will check out of the hotel and depart with your guide. 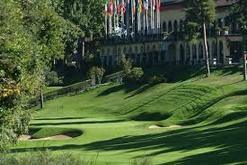 The golfers will be dropped off at "Circolo Golf Villa d' Este". This club, built in 1926 with its' incomparable natural beauty of fairways cut out of the birch and chestnut forest, features strategic bunkering around the greens. 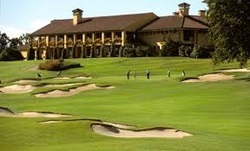 Throughout the years it has been the golf venue for the rich and famous and has been the site of the Italian Open. The non-golfers will continue on with their guide to Como Today you can stroll through the historic Como city center, along the waterfront promenade. The golfers will join you in the afternoon and you will be free to continue exploring the town and have dinner on your own. Check in at your hotel in Como city center. 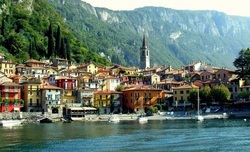 Boat trip to Bellagio, the Pearl of Lake Como! Bellagro is a maze of small stone lanes, alley ways, and stairways filled with shops, gelato bars, cafes, and restaurants. After breakfast and checkout you will depart with your guide for a tour of the Italian financial and international fashion capital-Milan. Visit the Cathedral, the Sforzesco Castle and all the main attractions of the city. After breakfast a driver will transport the golfers to play either Arzaga Golf Club or Garda Golf and Country Club. The beautiful Arzaga Golf Club, with two 18 hole courses designed by Jack Nicholas II and Gary Player, plays against a backdrop of the towering Alps. Garda Golf and Country Club has 27 holes that wind through the olive and cypress trees. This course has been the site of many men and women's Italian Opens. Departure for Piedmont region. Stop in a local winery and have a wine tasting and a wine cellar tour in the area of Barbaresco wine. Visit the Castle of Grinzane Cavour, home of the first Prime Minister of Italy and settle at a local country farm. Dinner at the resort. Your guide will take you though the countryside to visit the area famous for "Barolo" wine. You will visit a historical wine cellar and a small corkscrew museum showcasing the history of various wine opening tools. Your group will then return to the Relais for a fun Italian cooking class followed by a farewell dinner.